Mallory-Weiss tears account for an estimated 1-15% of cases of upper gastrointestinal bleeding. Although the age range varies widely, affected individuals are generally in middle age (40s-50s), and men reportedly have a higher incidence than women by a ratio of 2-4:1. The images below depict Mallory-Weiss tears. Mallory-Weiss tear with a pigmented protuberance and active oozing. Precipitating factors include retching, vomiting, straining, hiccupping, coughing, primal scream therapy, blunt abdominal trauma, and cardiopulmonary resuscitation. In a few cases, no apparent precipitating factor can be identified. One study reported that 25% of patients had no identifiable risk factor. The presence of a hiatal hernia is a predisposing factor and is found in 35-100% of patients with Mallory-Weiss tears. During retching or vomiting, the transmural pressure gradient is greater within the hernia than the rest of the stomach, and it is the location most likely to sustain a tear (see Potential Mechanisms for Mallory-Weiss Tears). Mallory-Weiss tears are usually associated with other mucosal lesions. In one study, 83% of patients had additional mucosal abnormalities potentially contributing to bleeding or actually causing retching and vomiting that would induce these tears. Iatrogenic tears are uncommon, considering the frequency with which patients retch during endoscopy. The reported prevalence is 0.07-0.49%. A Mallory-Weiss tear likely occurs as a result of a large, rapidly occurring, and transient transmural pressure gradient across the region of the gastroesophageal junction. Acute distention of the nondistensible lower esophagus can also produce a linear tear in this region. With a rapid rise in intragastric pressure due to precipitating factors, such as retching or vomiting, the transmural pressure gradient increases dramatically across the hiatal hernia, which abuts a low intrathoracic pressure zone. If the shearing forces are high enough, a longitudinal laceration eventually occurs. Within the hernia, the tear is more likely to involve the lesser curvature of the gastric cardia, which is relatively immobile compared to the remainder of the stomach. Another potential mechanism for Mallory-Weiss tears is the violent prolapse or intussusception of the upper stomach into the esophagus, as can be witnessed during forceful retching at endoscopy. Less common presenting symptoms include melena, hematochezia, syncope, and abdominal pain, and excessive alcohol use has been reported in 40-75% of patients,  and aspirin use has been reported in up to 30% of patients  (see Risk Factors for Mallory-Weiss Tears). Specific physical signs are generally not present for Mallory-Weiss tears. However, physical findings relate to the rate and the degree of gastrointestinal blood loss. Tachycardia, hypotension, orthostatic changes, or overt shock may be evident. 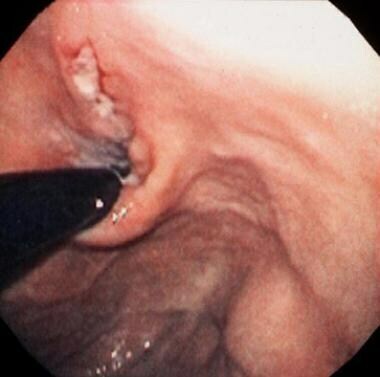 Perform endoscopy early in the clinical course; this technique is the procedure of choice for both diagnosis and therapy of these lesions. 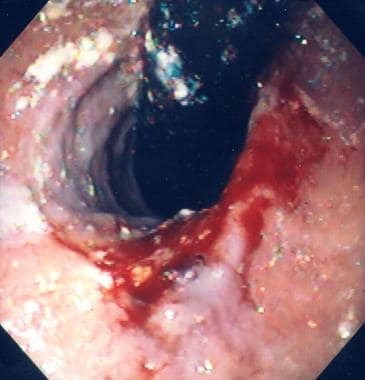 Endoscopic diagnosis of a Mallory-Weiss tear is readily made by identifying active bleeding, an adherent clot, or a fibrin crust over a mucosal split within or near the gastroesophageal junction (see the following image). 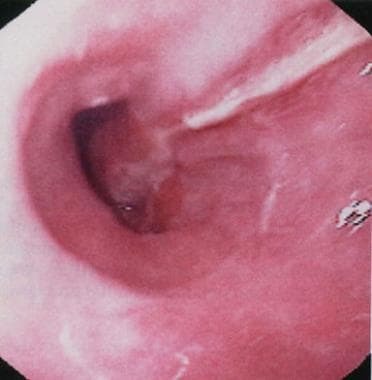 When a Mallory-Weiss tear is suspected, also consider other conditions such as Boerhaave syndrome, esophagitis, gastric ulcers and Cameron erosions. Hematologic studies, chemistries, and type and screen are among laboratory studies performed to evaluate the patient's clinical statuses. Obtain hemoglobin and hematocrit studies to assess the severity of the initial bleeding episode and to monitor patients. In addition, platelet count, prothrombin time (PT), and activated partial thromboplastin time (aPTT) are used to assess for severe thrombocytopenia and coagulopathy as complicating issues. Coagulation studies are needed in patients on anticoagulants or with minimal or no oral intake while on antibiotics. The platelet count may be low because of alcohol use. Blood urea nitrogen (BUN), creatinine, and electrolyte levels are measured to guide intravenous fluid therapy, and blood type and antibody screen are obtained for potential blood transfusions. Obtain an electrocardiogram and cardiac enzymes, if indicated, to assess for myocardial ischemia related to acute gastrointestinal blood loss, especially in patients with significant anemia, hemodynamic instability, cardiovascular disease, coexisting chest pain, and/or advanced age. Endoscopic diagnosis of a Mallory-Weiss tear is readily made by identifying active bleeding, an adherent clot, or a fibrin crust over a mucosal split within or near the gastroesophageal junction. On average, the split is 2-3 cm in length and a few millimeters in width. Most patients (>80%) present with a single tear. The usual location of the tear is just below the gastroesophageal junction on the lesser curvature of the stomach (between 2 and 6 o'clock meridian on endoscopic viewing with the patient in the left lateral decubitus position) (see the image below). Barium or Gastrografin studies should not be performed in patients with suspected Mallory-Weiss tears owing to their low diagnostic sensitivity and interference with endoscopic assessment and therapy. Initial management of Mallory-Weiss tears consists of implementing resuscitative measures as appropriate, performing endoscopy promptly, and triaging patients to intensive care, hospital inpatient, or outpatient management, depending on the severity of bleeding, comorbidities, and risk of rebleeding and complications. Monitor the patient’s vital signs, obtain serial hemoglobin and hematocrit values (q6h initially), watch for clinical signs of rebleeding, correct coagulopathy if possible, and maintain hemodynamic support with fluid and blood replacement. Control or eliminate precipitating factors, such as nausea and vomiting. Acid suppression (eg, omeprazole) and antiemetic drug therapy (eg, prochlorperazine) are sufficient in most patients presenting with a Mallory-Weiss tear. Transfuse, generally, for hemoglobin levels less than 8 g/dL (< 10 g/dL for patients with cardiopulmonary disease). Five to 35% of patients require some form of intervention, mostly endoscopic. See specific endoscopic therapy for actively bleeding Mallory-Weiss tears in Endoscopic Management. Treat other associated lesions observed endoscopically, as appropriate. Fasting is restricted to hemodynamically unstable patients and to those who require repeat endoscopic intervention within a short time because of uncertainty regarding the effectiveness of endoscopic therapy or possible complication of the initial therapy. Unless nausea or vomiting is an issue, patients can resume oral intake following endoscopy, starting with a clear- or full-liquid diet and advancing as tolerated to a regular diet within 48 hours. Consultation with an interventional vascular radiologist may be helpful to attempt angiotherapy for bleeding that remains uncontrolled by endoscopic means (see Angiotherapy). Also obtain a surgical consultation as surgery may be needed as salvage therapy for failed endoscopic and/or radiologic intervention. Several endoscopic modalities are effective for treating a bleeding Mallory-Weiss tear. The choice usually depends on the endoscopist's familiarity with a particular technique and on equipment availability. Most patients have stopped bleeding at the time of endoscopy. Patients with actively bleeding Mallory-Weiss tears (ie, arterial spurting, streaming from focal point, diffuse oozing) are treated. Stigmata (eg, nonbleeding visible vessel, adherent clot) do not necessarily require treatment in Mallory-Weiss tears as they do in peptic ulcers. Such stigmata are usually not treated unless they are rebleeding episodes from the same lesion or are associated with a coagulopathy. [10, 11] Tears with a clean, fibrinous base or with flat, pigmented spots are not treated, as the risk of rebleeding is minimal. The MPEC or heater probe is applied on the bleeding point with mild to moderate pressure. Suggested treatment parameters for MPEC include a power setting of 14-16 watts (W), 3-4 seconds per application, and 1-5 applications on average. Suggested treatment parameters for heater probe include 15- to 20-joule (J) pulses in a sequence of 2-3 pulses. The endpoint is cessation of bleeding and formation of a white coagulum. Epinephrine injection (1:10,000-1:20,000 dilution) reduces or stops bleeding via a mechanism of vasoconstriction and tamponade. This treatment is usually combined with a more definitive therapy (eg, thermal therapy). Aliquots of 0.5-1 mL are injected around and into the bleeding point. No ceiling volume has been identified, and as much as 20 mL of epinephrine have been used. Careful monitoring is required, as submucosal esophageal injection of epinephrine may enter the systemic circulation without a protective first-pass effect, potentially causing serious cardiovascular complications. Epinephrine injection is best avoided in patients with active cardiovascular disease. Successful use of sclerosants, such as alcohol or polidocanol, has been reported. [13, 14] Safer alternatives exist, and sclerosant injection is not recommended by some authors because of its potent tissue-damaging effects, risk of deep tissue necrosis, and potential for perforation. Reports on the use of the argon plasma coagulator (APC) in the treatment of bleeding Mallory-Weiss tears are limited, but this noncontact device is gaining in popularity owing to its ease of use. In the thin-walled esophagus, the power output should be set at 40-45 W and with a relatively low argon gas flow rate (1 L/min). The APC probe should be maintained 1-2 mm from the target site, which may be difficult to accomplish in the setting of peristalsis. Endoscopic band ligation has been shown to be effective for treating bleeding Mallory-Weiss tears. In a small, prospective, randomized study of 34 patients with actively bleeding lesions, no difference was detected in the efficacy or safety of band ligation versus epinephrine injection. Band ligation should be particularly useful for bleeding Mallory-Weiss tears associated with portal hypertension and gastroesophageal varices, in which thermal therapy is not recommended. Endoscopic hemoclip placement using the 2-pronged clip devices is also effective for Mallory-Weiss tears. [16, 17] The margins of the tear may be approximated, starting at the distal end of the tear and applying successive clips in a cephalad fashion. Alternatively, only the bleeding point can be targeted for hemoclip placement. Optimal deployment of clips may not be achievable because of the tangential location of the tear, or the tear may be too wide. In a study of 26 patients, however, hemoclipping was technically successful in all cases, and the average number of clips used was 2.8 + 1.6 (range, 1-8). In a randomized prospective study of 35 patients with actively bleeding lesions, hemoclip placement and epinephrine injection were equally effective for achieving primary hemostasis. Whenever feasible, some authors favor the use of hemoclips over thermal modalities, as thermal modalities may cause excessive tissue injury leading to necrosis and perforation. The recently introduced over-the-scope clip (OTSC) device may also be useful for closure of a Mallory-Weiss tear, but experience is limited with this device. Although earlier studies reported balloon tamponade to be beneficial, this technique should probably be avoided, as it recreates the forces that predispose patients to lacerations and may further widen the tear. Surgical oversewing of the tear is reserved for the occasional bleeding case that is refractory to endoscopic therapy or angiotherapy. Watch for recurrent symptoms or signs of rebleeding. In addition, an acid suppressant (eg, proton pump inhibitor; omeprazole, 20 mg PO qd) or a mucosal protectant (eg, sucralfate, 1 g PO qid) is usually prescribed for 1-2 weeks to accelerate healing by reducing injurious factors, such as acid, pepsin, or bile, that impair the healing of the mucosal tear. However, this practice is of unproven benefit. An antiemetic (eg, prochlorperazine) is useful for controlling nausea and vomiting, common precipitating factors for Mallory-Weiss tears. Complications, such as myocardial ischemia or infarction,  hypovolemic shock, and death, usually relate to the acuity and the severity of bleeding and to associated comorbidities. Fortunately, these complications are uncommon with the current standard of care. Perforation or aggravation of bleeding during endoscopic therapy is a potential complication, and organ ischemia and infarction are potential complications of angiotherapy. The prognosis of Mallory-Weiss tears is generally good. Bleeding from these lesions stops spontaneously in 80-90% of patients. With conservative therapy, most tears heal uneventfully within 48-72 hours. Thus, a Mallory-Weiss tear can easily be missed if endoscopy is delayed. The degree of blood loss varies. Earlier studies reported that the proportion of patients requiring blood transfusions was 40-70%. Currently, these figures are probably significantly lower. Hemodynamic instability and shock may occur in up to 10% of patients with Mallory-Weiss tears. In one series, mortality as high as 8.6% was attributed to these lesions; however, current clinical experience suggests a significantly lower mortality rate from Mallory-Weiss tears. Recurrence of these lesions is rare. However, counsel patients who have had a Mallory-Weiss tear on precipitating factors (eg, alcoholic binge, excessive straining and lifting, violent coughing) that may lead to a recurrent lesion (see Risk Factors for Mallory-Weiss Tears). Perform endoscopy promptly when indicated. Mallory-Weiss tears heal rapidly and may not be readily apparent when endoscopically evaluated 2-3 days later. In addition, the endoscopic examination should be thorough, as coexisting lesions are not uncommon. These lesions may be actual or potential bleeding sites or precipitants of the Mallory-Weiss tear. Mallory GK, Weiss SW. Hemorrhages from lacerations of the cardiac orifice of the stomach due to vomiting. Am J Med Sci. 1929. 178:506-12. Cappell MS, Dass K, Manickam P. Characterization of the syndrome of UGI bleeding from a Mallory-Weiss tear associated with transesophageal echocardiography. Dig Dis Sci. 2014 Oct. 59(10):2381-9. [Medline]. Sugawa C, Benishek D, Walt AJ. Mallory-Weiss syndrome. A study of 224 patients. Am J Surg. 1983 Jan. 145(1):30-3. [Medline]. Knauer CM. Mallory-Weiss syndrome. Characterization of 75 Mallory-Weiss lacerations in 528 patients with upper gastrointestinal hemorrhage. Gastroenterology. 1976 Jul. 71(1):5-8. [Medline]. Montalvo RD, Lee M. Retrospective analysis of iatrogenic Mallory-Weiss tears occurring during upper gastrointestinal endoscopy. Hepatogastroenterology. 1996 Jan-Feb. 43(7):174-7. [Medline]. Kortas DY, Haas LS, Simpson WG, Nickl NJ 3rd, Gates LK Jr. Mallory-Weiss tear: predisposing factors and predictors of a complicated course. Am J Gastroenterol. 2001 Oct. 96(10):2863-5. [Medline]. Bharucha AE, Gostout CJ, Balm RK. Clinical and endoscopic risk factors in the Mallory-Weiss syndrome. Am J Gastroenterol. 1997 May. 92(5):805-8. [Medline]. Kim JW, Kim HS, Byun JW. Predictive factors of recurrent bleeding in Mallory-Weiss syndrome. Korean J Gastroenterol. 2005 Dec. 46(6):447-54. Laine L. Multipolar electrocoagulation in the treatment of active upper gastrointestinal tract hemorrhage. A prospective controlled trial. N Engl J Med. 1987 Jun 25. 316(26):1613-7. [Medline]. Llach J, Elizalde JI, Guevara MC, et al. Endoscopic injection therapy in bleeding Mallory-Weiss syndrome: a randomized controlled trial. Gastrointest Endosc. 2001 Dec. 54(6):679-81. [Medline]. Bataller R, Llach J, Salmeron JM, et al. Endoscopic sclerotherapy in upper gastrointestinal bleeding due to the Mallory-Weiss syndrome. Am J Gastroenterol. 1994 Dec. 89(12):2147-50. [Medline]. Huang SP, Wang HP, Lee YC, et al. Endoscopic hemoclip placement and epinephrine injection for Mallory-Weiss syndrome with active bleeding. Gastrointest Endosc. 2002 Jun. 55(7):842-6. [Medline]. Yamaguchi Y, Yamato T, Katsumi N, et al. Endoscopic hemoclipping for upper GI bleeding due to Mallory-Weiss syndrome. Gastrointest Endosc. 2001 Apr. 53(4):427-30. [Medline]. Pezzulli FA, Purnell FM, Dillon EH. The Mallory-Weiss syndrome. Case report and update on embolization versus intraarterial vasopressin results. N Y State J Med. 1986 Jun. 86(6):312-4. [Medline]. Stevens PD, Lebwohl O. Hypertensive emergency and ventricular tachycardia after endoscopic epinephrine injection of a Mallory-Weiss tear. Gastrointest Endosc. 1994 Jan-Feb. 40(1):77-8. [Medline]. Ljubicic N, Budimir I, Pavic T, et al. Mortality in high-risk patients with bleeding Mallory-Weiss syndrome is similar to that of peptic ulcer bleeding. Results of a prospective database study. Scand J Gastroenterol. 2014 Apr. 49(4):458-64. [Medline].